Six years in the making, Alcyona is dream of Belarus native Natalia Malei, keyboard player and principal lyricist/composer. In the same time, Malei needed to fill out her band to fulfill her vision of creating lyrical melodic metal. She's joined by bass player and composer Evgeniy Malei, lead vocalist Olga Terentyeva, drummer Anatoly Afanasenok, and guitarist Nikolai Sidorevich. Alcyona arrives with their first album, Trailblazer for Germany's Pride & Joy Music. 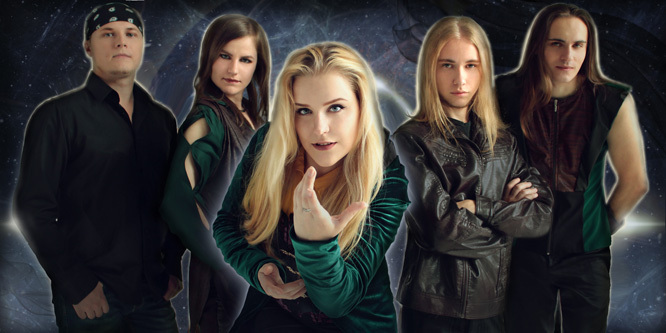 Saying it simply, Alcyona plays melodic and symphonic heavy metal, with female lead vocals at the forefront. I know what you're thinking, "There's nothing new under the sun." Bands of the same style seem to pop up daily. Compare Alcyona to peers such as Delain, Serenity, Epica, or Edenbridge, and you get the picture. Yet, the Alcyona sound is genuine in the sense that it is creative and passionate. But like most other female-fronted symphonic metal band it's also derivative, in the sense that certain things are expected and occur in the music. Alcyona builds upon traditional heavy metal, then adds great melody and harmony, especially in the twin guitar lines and vocal arrangements. Of course, epic guitar solos rise in each song. Being the principal composer and keyboard player, Ms. Malei adds synths for a lush symphonic layer and flourishes of keyboard solos for accent. Sometimes she simply uses her piano line to drive the the melody of a song as with Memories In The Vessel. In the same song you get a taste of her solo accents, when you hear harpsichord in the middle (which is followed by what sounds like carnival music). As for straight synth solos they seem almost subdued throughout. Within the Lost Valley the duel with the guitar solo. The rhythm section delivers on two fronts, giving songs the groove of hard rock and the speed of power metal, each in its proper place. For the rock groove you hear it within Kings Of Show, right from the start in the drum line. For the swiftness of power metal, you'll find it in the speedy The Lost Valley. As for Ms. Terentyeva, she sings melodic, clean, and with the strength to rise above the music (but that could simply come from good mixing and mastering). She does have the right blend of metal singer with an operatic side to her vocal presentation. Honestly, considering the abundance of female-fronted symphonic metal bands, Alcyona is not really offering anything new, groundbreaking, or something that is going upset the genre's ranks. Nevertheless, on the strength of creative song composition and solid musicianship, Alcyona and Trailblazer should capture the attention of the diehard fans who love the genre. Besides, it all sounds pretty terrific, too. RIYL Delain, Serenity, Epica, or Edenbridge. 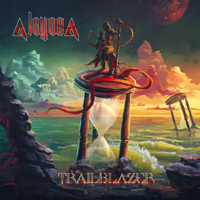 On the strength of creative song composition and solid musicianship, Alcyona and Trailblazer should capture the attention of the diehard fans who love female-fronted symphonic metal bands. Even though they're just one more. But it still sounds pretty terrific. Recommended.